IMO posts about Brizzle is fab – WhatZupBristol! I’m playing catch up on reviews a little. We actually visited the city centre outlet of steak restaurant Miller & Carter back in December 2018, on their opening weekend – but what with Christmas, the baby’s first birthday and everything else that life throws at us, Bristol Bites has taken a bit of a back seat. Located within the Bristol Marriott Royal Hotel on College Green, there’s no denying that the place looks like a hotel restaurant. The Miller & Carter team have done their best to give it a steakhouse feel – big comfy leather chairs, cow pictures on the walls and an open plan kitchen at the back pumping out the smell of steak – but there’s no denying the place’s roots. What’s more, we were treated to the added “decoration” of the remains of long-ago-eaten hotel breakfasts strewn across the carpet: it was clear that no cleaning had been done between the breakfast and lunch services. Since we visited, we’d hope the service is a bit more up to scratch, too. When we arrived, we were treated to a sullen, unsmiling look from the guy on the front desk – and half an hour sitting at our table (which, with a young baby, is an even longer time) before both food and drinks orders were taken. This, despite an enormous number of staff milling around the restaurant. It gave us a good chance to peruse the menu, if nothing else. While steak is obviously the highlight (ranging from £15.95 for an 8oz rump to £59.95 for the Miller & Carter “Butcher’s Block” sharing steak platter), you’ll also find dishes like burgers, BBQ glazed chicken breasts, ribs, salads, grilled seabass and more. There’s a separate menu for the younger diners, too, as well as various lunch, date night and Sunday dining options. For us, it was all about the steak. 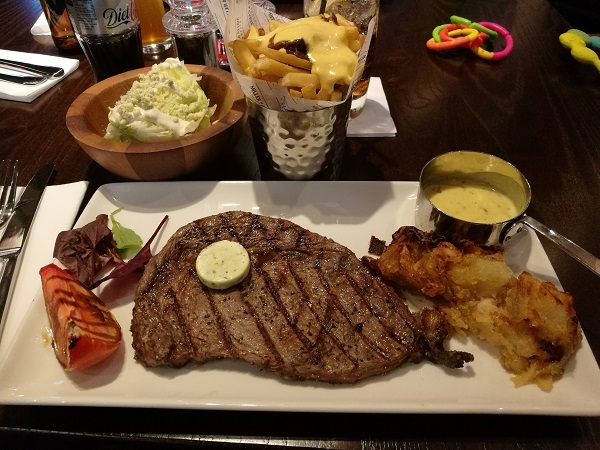 Every steak on the menu comes with a variety of sides: fries, parsley butter, beef tomato, a slice of onion loaf, a lettuce wedge with a choice of dressings, and your choice of steak sauce. It was a further 35 minutes after ordering before our food arrived at the table…so, was it worth the wait? Chris’ steak was stunning: a 10oz grass-fed and wonderfully tender Black Angus sirloin (£24.95), served perfectly medium rare and beautifully seasoned. To accompany it, he chose a rich, decadent beef dripping sauce that was eagerly mopped up. And no complaints about the cooking of my steak, either: my medium 12oz ribeye (£22.95) was cooked exactly how it should be, with a lovely char on the outside – although sadly much of the steak’s flavour was masked by an excess of black pepper. The thick slice of onion loaf was just as tasty as I remember from previous Miller & Carter visits, but very oily – and the Cribbs branch is definitely more generous when it comes to the amount of sauce on their lettuce wedges too. There was barely any crumbled Stilton or creamy blue cheese sauce on mine. 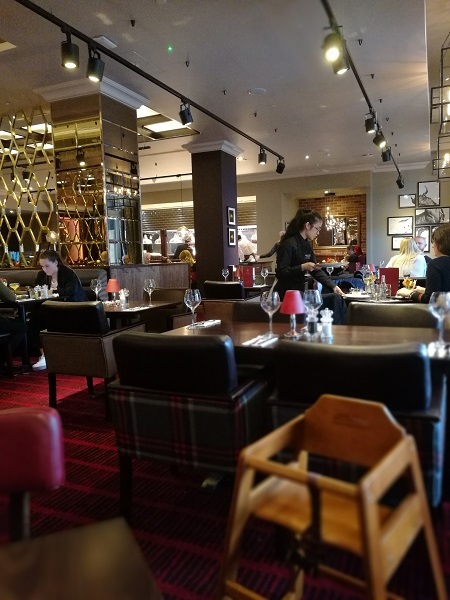 The post Miller & Carter, Bristol City Centre: Review appeared first on Bristol Bites.